A US and another NATO soldier were killed in Afghanistan on Tuesday. On the other side of the border, Pakistani Taliban sources announced that their leader, Hakimullah Mahsud, had died of wounds inflicted by a US drone attack. Mahsud was allegedly behind a wave of bombings in Pakistan, and played a role in the suicide attack against a US base in southern Afghanistan, in which three CIA field officers were killed along with four private security contractors. Many US analysts see Mahsud’s death as a dire blow to the Pakistani Taliban. But in my exprience Americans put too much emphasis on the CEO and not enough on the ordinary workers. Another leader of the Pakistani Taliban will emerge. Most insurgents in Afghanistan are from the Pashtun ethnic group,and Pashtuns for the most part are organized into small clans that are not very hierarchical (i.e. the tribesmen think they’re every bit as good as the chief and his uncle.) So they know how to operate by using small cells and avoiding a corporate organization chart. And revenge is a more common Pashtun attribute than admitting defeat. Back in Afghanistan, McClatchy’s Saeed Shah reports that only about 1200 residents have fled the Afghan city of Marjah in Nad Ali district, ahead of a major NATO/ Afghan invasion planned for later this week. The city of 80,000 is controlled by some 2000 Taliban fighters and there are many heroin labs, the profits of which help to support the Taliban. The refusal of locals to leave in any large numbers may be what prompted US commanders to begin telling the people of Marjah to ‘stay inside their homes’ and stay out of the way of the fighting. This message is a 180 degree reversal of the earlier message, that locals should leave. 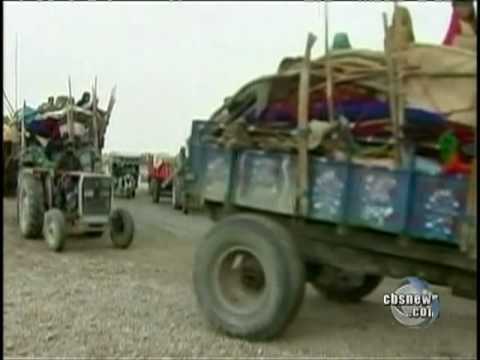 CBS News reports embedded with the US Marines outside Marjah, to the southwest of the Helmand capital of Lashkar Gah. This report gives the impression that substantial numbers of civilians have left or are leaving, but this assertion appears not to be true. The NATO / Kabul plan is to chase the Taliban out of Marjah, win local hearts and minds, and garrison it with Afghan army troops in the aftermath to ensure that the Taliban do not return. This plan requires that the operation not do so much damage to the city and kill so many locals that they are alienated in the long term. It also requires trustworthy Afghan troops who won’t just abuse their authority and who are good enough war fighters to fend off a Taliban return. Local police in Halmand, at least, are proving a disappointment to NATO because of their high rates of drug use. Troops found using heroin are immediately drummed out, but a local police commander admits that he cannot be so severe with the hashish users, since if he fired them all, nobody would be left. Radio Azadi reports in Dari Persian that Mohammad Gul Mangal, the governor of Helmand said in an interview that the operation is designed to bring Marjah back under central government rule, after which a rebuilding and development program will be launched. The question hanging over the Marjah campaign is whether it will allow a winning of hearts and minds. But if it is highly destructive of local homes and the lives of locals, no amount of US PR will prevent an outpouring of grief and resentment. And remember the Pashtun dedication to the vendetta and revenge.